Located in Bellingham, Washington, Fiamma Burger's mission is to bring you the best burgers you can eat. Way back in the early 2000s, owners Dan and Ken (of local La Fiamma :: Wood Fire Pizza fame) set out to bring a burger restaurant worth craving to downtown Bellingham. In 2007, Fiamma Burger opened its doors to crowds of eager burger fans. Fiamma Burger serves all natural, hormone-free, Northwest beef ground fresh in-house. Our buttery brioche buns are baked daily and delivered by cargo bike from our own bakery down the street. We are constantly testing new burger ideas and our menu represents that effort. We only offer delicious burgers made from ingredients that come from good places. All made to order by real people. We are proud to be a part of this amazing community. We love Bellingham and we hope that we’re part of your family. 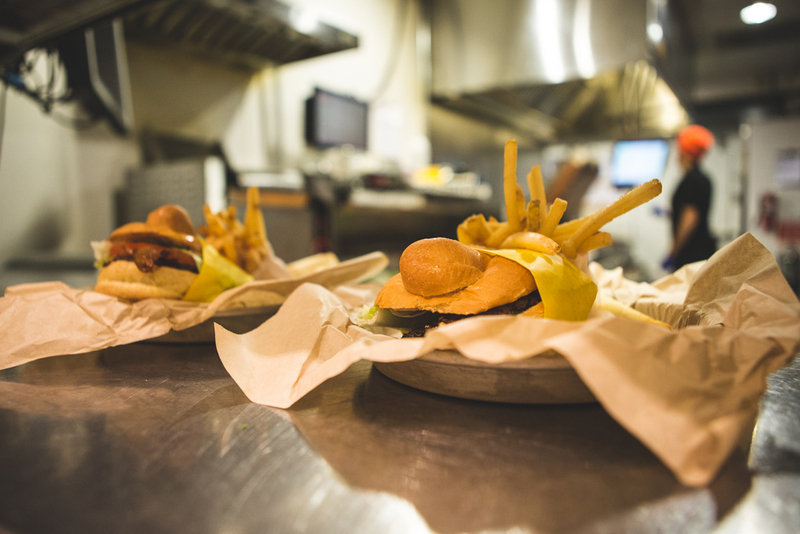 Whether you're a Bellingham native or just visiting for the day, our goal is to make burgers you love as much as we love making them for you. Quarter pound beef patty with lettuce, onion, tomato, pickles + secret sauce. Lettuce, onion, tomato, pickles + secret sauce. Two 3-oz beef patties, grilled onions, pickles, ketchup, mayo and American cheese. A smaller burger for a smaller appetite. with ketchup, mustard, pickles, and onion. Cheddar-jack, Swiss, American, queso, smoked cheddar, blue cheese, provolone or pepper-jack. Topped with an onion ring, blue cheese, bacon and BBQ sauce. Plus lettuce, tomato, pickles + secret sauce. House-smoked BBQ pork, topped with shoe-string potatoes and our coleslaw. Northwest lamb with arugula, curry mayo, crispy fried potatoes and pickled red onions. Black bean patty with Hatch green chiles, guac, and pepper-jack. With lettuce, tomato, pickles, onion and secret sauce. Vegan option is available. Arugula, roasted garlic, smoked onions, cheddar-jack and horseradish mayo. Your choice of bison, elk or local grass-fed beef. Beef burger topped with cheese, prosciutto (salt-cured Italian ham), egg*, shoe-string potatoes and smokey sauce. Hatch green chilis, queso and pepper jack cheese, fried serrano pepper, lettuce, tomato, pickle, onion and secret sauce. Sautéed fresh mushrooms, roasted garlic, and grilled onions with Swiss cheese. Plus lettuce, tomato, pickles + secret sauce. Made in-house from scratch with wild Alaska salmon. Includes lettuce, tomato, pickles, onion and tartar sauce. Any burger served over a bed of organic spring greens without the bun. Secret sauce on the side. It’s free to substitute our scratch-made veggie patty on any burger. Buttermilk-brined fried chicken, lettuce, tomato, pickles, onion and roasted garlic mayo. Buttermilk-brined fried chicken, bacon, ranch, lettuce, tomato, pickles and onion. Spicy fried chicken with pickles + garlic mayo. Add a fountain drink and fries to your entree. Substitute a milkshake for your fountain drink. Substitute a draft beer for your fountain drink. Substitute tallboy for your fountain drink. Swap your potato fries for fancier fries. Rhubarb Hibiscus Lemonade or Orange Tang. chocolate, vanilla or strawberry. See sign for featured shakes. chocolate, vanilla or twist in a sugar cone. With chili lime + a side of our ranch. Sweet onion coated w/seasoned corn meal. Tossed in garlic butter, parmesan + parsley. Beef gravy, potato fries w/cheese curds + herbs. With our Sudden Valley ranch or house vinaigrette. Fried egg, cheddar-jack, fried shoestring potatoes and pesto mayo. Fresh ground pork sausage, fried egg, chedda-jack cheese, hot sauce mayo. Our sundried tomato/arugula chicken sausage, provolone cheese, fried egg + mayo. Bacon, fried egg, cheese and pesto mayo. Fried egg, red peppers, arugula, Swiss cheese and pesto mayo. Spicy chorizo, smoked cheddar, egg, shoestring potatoes and smokey sauce. Served on a bun. Potatoes with onions and a drizzle of sour cream. Served with 2 eggs. Like the Basic Hash but with cheese. Same as above, plus bacon, red peppers, jack cheese and a drizzle of sour cream. Potatoes, onions, broccoli, red peppers, zucchini, jack cheese, 2 eggs and a drizzle of sour cream. Basic hash + smoked/pulled pork + hatch green chiles + jack cheese + 2 eggs + a drizzle of sour cream. Potatoes, onions, jack cheese and pork sausage with country gravy. Served with 2 eggs. House-baked biscuit with our pork sausage country gravy and an egg*. 2 pancakes, 2 eggs* your way and your choice of meat. Eggs, potatoes, smoked cheddar cheese and breakfast sauce. Your choice of meat or veggie. With charred tomato ranchero sauce. We make our breakfast burritos to order. During the weekdays, we prepare a handful of grab and go burritos for guests in a hurry. Selection is limited to supply on hand. Pancakes or egg sandwich and a 'tater cake. Kid sized. Served with a drink. Walkingstick - aka Walking Hashbrowns. +*Eggs are cooked to order. Ordering/consuming undercooked eggs can increase your risk of food-borne illness. Our happy hour runs from 3pm-6pm and 8pm-close every day. During these times, please enjoy our happy hour specials. We like our beer tasty, we like our beer cold, and we like our beer local. We offer Rainier, Olympia, Hamms, A.V.B.C, Avery Brewing, Oscar Blues, Maui Brewing, Seattle Cider, 21st Amendment and more.